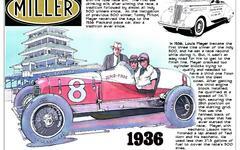 This article recounts the Indianapolis Motor Speedway practice crash of Lozier driver Harold Van Gorder. This Lozier was a private entry owned by W.H. Chambers of McKeesport, Pennsylvania and not a teammate to eventual second place finisher Ralph Mulford. Van Gorder blew a front tire exiting turn four and slammed into the outer concrete retaining wall. His riding mechanic, Walter Bardell, was hurled from the car to land on the brick pavement. He suffered a broken shoulder and facial lascerations. Thirty feet of the concrete barrier was knocked down and the car rolled over. Interestingly, the car was righted, two smashed wheels were replaced, and then it was driven back to the garage. Still, it was accessed as too damaged to be repaired in time for the first Indianapolis 500 three days later. The accident occured May 27, 1911. An image of the car on its back is included in this package. The article also discusses the process of technical inspection for the cars and the drivers meeting held the evening of May 27. The article was published May 28, 1911 in the Indianapolis Star.